This is your opportunity to own a historic, brick, home in N.E. Ohio built by William Foster. 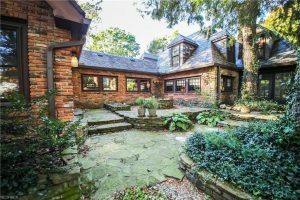 Known as the play ground during prohibition times, this home offers Castle like features that include stone archways and rustic exposed beams. Let your imagination run wild as you plot ways to make this extraordinary home your own. Historic detailing combines with modern amenities as reflected in this gourmet chef’s kitchen complete with subzero refrigerator and Viking stove. This private estate invokes a sense of grand comfort with over 4600 sq ft of craftsmanship indoors and 2,8 acres out! Guests will be captivated by the design of the wool carpeting and details this home has, right up to the stained glass door. Enjoy exploring the different wings of this home and details of each individual room. Find the craftsmanship in the masters stamped tin ceiling, and safety of the hidden panic room and shooting tunnel. There are several outside adventures in the past gardens and overgrown rock walkways that extend over ¾ mile throughout the property. This property includes 2 separate 1 acre build able lots to the west that have been zoned and cleared for septic, for a total of 2.8 acres. Homes is very well maintained and boasts a newer slate roof (60 yr life expectancy), and newer electrical wiring placed in the 90’s. Come explore! To view more visit our listing tab………….